The Invoice payment method will allow your attendees/registrants to pay for their event registration via an invoice. No installation is required. 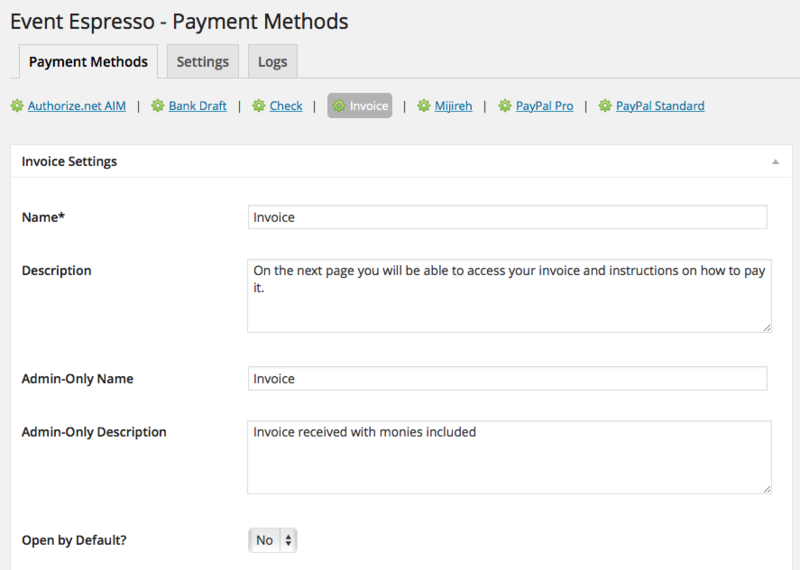 The Invoice payment method is included with the Event Espresso 4 core plugin. Login to your WP-admin (WP Dashboard) and go to Event Espresso –> General Settings –> Payment Methods. Once on the Payment Methods screen, click on Invoice and click on the button to activate the payment method. Payee Name – The [INVOICE_PAYEE_NAME] shortcode is parsed to the value of this field if present, if this field is blank then it’s parsed to the payee name set in the organization settings page, if that page is blank then it parses to an empty string. Payee Email – The [INVOICE_PAYEE_EMAIL] shortcode is parsed to the value of this field if present, if this field is blank then it’s parsed to the payee email set in the organization settings page, if that page is blank then it parses to an empty string. Payee Tax Number? – The [INVOICE_PAYEE_TAX_NUMBER_*] shortcode is parsed to the value of this field if present, if this field is blank then it’s parsed to the payee tax number set in the organization settings page, if that page is blank then it parses to an empty string. Payee Address – The shortcode [INVOICE_PAYEE_ADDRESS] is parsed to the value of this field if present. If this field is empty, then the shortcode will use the value of the company address set in the organization settings page. If that value is empty, then an empty string is used. Instructions – Provide instructions for how the invoice should be paid. Logo Image – Upload a logo for your invoice. This will appear in the top left area of the invoice. Confirmation Text – This text appears on the thank you page after a registration using Invoice as the payment method. Extra Info – Any extra HTML you may like to include after the confirmation text. The invoice layout and content can be changed through the Messages system in Event Espresso and the following steps are optional. Go to WP-admin (WP dashboard) –> Event Espresso –> Messages. Then locate the invoice message type. You may need to adjust the pagination to show it on page 1 or click to go to page 2 (located towards the bottom right area of screen). Then click on the recipient for Purchaser. You can then edit the invoice as needed. Be sure to save changes by clicking on the Save button once you are finished. The Invoice payment method will let your registrants/attendees be “invoiced” so they can pay later at a specified time. I configured Invoice and payments are not being processed. Can you help? This payment method does not process or transfer actual funds (monies). You’ll need to provide instructions on how an attendee/registrant can pay for their invoice. This can be done by using the Instructions field on the invoice payment method settings. The invoice is missing my logo. How do I fix this? The logo for the invoice is set through the payment methods screen for the Invoice payment method. Be sure to upload an image, select it, and then save changes to the payment method. How can I setup a recurring payment or subscription through Invoice? Recurring or subscription payments are not currently supported through the Invoice payment method.